Lone Eagle is located right across from the gondola in the River Run village. In keeping with its location it is also the newest premier luxury complex in town. Full health club facilities, heated outdoor pool, hot-tub, nicely equipped fitness room, spacious common lounge and library, an on-site concierge, ski lockers, boot dryers, and top of the line finishes everywhere give you an idea of what is in store for you at this beautiful lodge. As you would expect from a property of this calibre there is everything you could ever need: full kitchen; washer/dryer; dishwasher; garage parking; deck; gas fireplace; stereo; TV/VCR. 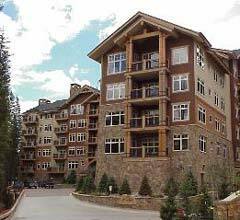 You will enjoy the quiet setting of Keystone Resorts most luxurious complex. Nicely tucked away in the woods at the base of Keystone Mountain, just steps from the gondola and the always popular River Run Village. This particular condo is a spacious 2 bedroom 2 bath corner unit is true Ski-in/Ski-out. The bedding is as follows: King in the Master, a King in the 2nd bedroom, and a Queen sofa sleeper in the living area, sleeping up to 6 people comfortably. There are 3 TV's, 3 VCR's a DVD player and a CD stereo for you entertainment.